A snow day is a great excuse to stay in your jammies and make a big deal of breakfast. 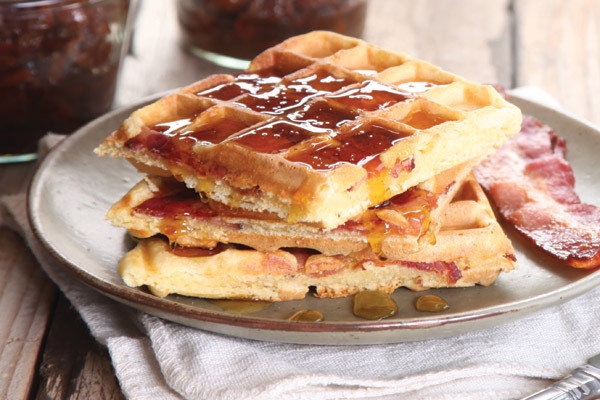 These cornmeal waffles make a tasty vehicle for crisp bacon. Lie strips directly onto the batter as it cooks. Douse with maple syrup. In a medium bowl, whisk together the flour, cornmeal, brown sugar, baking powder and salt. In a small bowl, whisk together the milk, eggs, oil or butter and vanilla. Add to the dry ingredients and whisk just until blended. Preheat your waffle iron and spray it with nonstick spray or brush it with oil. Ladle in 1/3 to 1/2 cup batter, lay a strip or two of cooked bacon over the top, close the lid and cook until golden and crisp. Serve immediately, or keep warm on a rack set on a baking sheet in a 250˚F oven while you cook the rest. Makes 8 square or 4 deep Belgian-style waffles. Per serving: 616 calories, 24.3 g fat (5.3 g saturated fat, 13.2 g monounsaturated fat, 5.7 g polyunsaturated fat), 75.4 g carbohydrate, 117 mg cholesterol, 19.6 g protein, 2.3 g fibre.